Craig Smith will be a key man for Peterborough Northern Star in the Hinchingbrooke Cup Final. The eagerly-anticipated Hinchingbrooke Cup final between city rivals Peterborough Northern Star and Peterborough Sports at Huntingdon Town FC tonight (May 11) has been postponed because of a waterlogged pitch. It means Sports will have to wait to claim their fourth trophy of a phenomenal season and Star’s bid to claim a shock win has been delayed. The match has been re-scheduled for Friday May 20 at Yaxley FC. Even though Star have played at a higher level than Sports this season, it’s the latter who will start the game as hot favourites. Sports are chasing an historic fourth major success of the season as they’ve already placed the United Counties Division One, the United Counties League Cup and the Northants Junior Cup silverware in the PSL trophy cabinet. Star have endured a tough season. 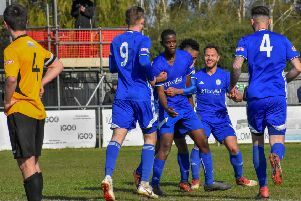 They finished 17th in the United Counties Premier Division, although new boss Raff Mazzerella only replaced Seb Hayes as first-team boss a couple of months ago. Mazzerella said: “We are under no illusions about the task ahead. We will need a lot of luck to lift the trophy. We need Sports to have an off day and we will need to play to the top of our game to win, but that’s not to say we can’t do it. “If we can replicate the attitude and the form we showed when beating Deeping Rangers in the semi-final we will have a great chance. “Sports have lost games this season so it’s not as though they are unbeatable, but they are a top team with a ridiculous amount of firepower. “I watched their other two finals when a top player like Josh Moreman was quiet, but they have so many other match-winners, they were still able to win. “I’ve actually struggled to put a squad together because the rules for this competition are quite restrictive, but we’ve had a boost as Craig Smith is available. But Sports boss Jimmy Dean believes Star are far more confident of victory in private than they are in public. He still believes his side will have enough to claim an unprecedented fourth trophy of the season. Dean said: “My player Ollie Medwynter’s brother plays for Star and I have seen messages that state they fancy beating us. They reckon they have a plan, a method that will work. “I’m confident they will pull 10 men behind the ball and try and hit us on the break with long balls to Craig Smith. As usual it will be up to us to play the football and break our opponents down. “We have been very good at overcoming whatever is put in front of us this season and I’m confident we will do it again. Sports are without star defender Mark Cox, while striker Avelino Vieira and midfielder Lewis Webb are struggling with knocks. The Cambs Invitation Cup Final between Wisbech Town and Cambridge City scheduled for the Abbey Stadium on Monday was postponed as ‘The Fenmen’ didn’t feel able to field a competitive side because of player commitments elsewhere. The match could now be re-arranged for pre-season at a different venue.